"Preisfrage, welches Geheimnis verbigt sich hinter Mystère? Ein französisches Jagdflugzeus aus den 50ern? Eine Show in Las Vegas? Ein französischer Kriminalkommissar? Alles falsch! By Mystère handeltes sich um eine neue Verstärkerlinie des holländischen Vertriebs Durob Audio." Statement: "Die Einstergerelektronik von Mystère bietet bereits alles, was man zum Musikhören braucht. Dazu tadellose Verarbeitung. Unbedingt zusammen ausprobieren! " Do you want to read more, click here. In Munich two audio shows open their doors at the same time. We find the largest one is in the MOC, a much smaller show takes place in the Marriott Hotel about 15 minutes away. 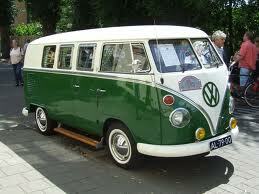 For everyone's convenience mini busses take you from one place to the other. Among the sixteen participants in the Marriott Hotel Show we find Ibex Audio, the German distributor of the Durob Audio brand Mystère. 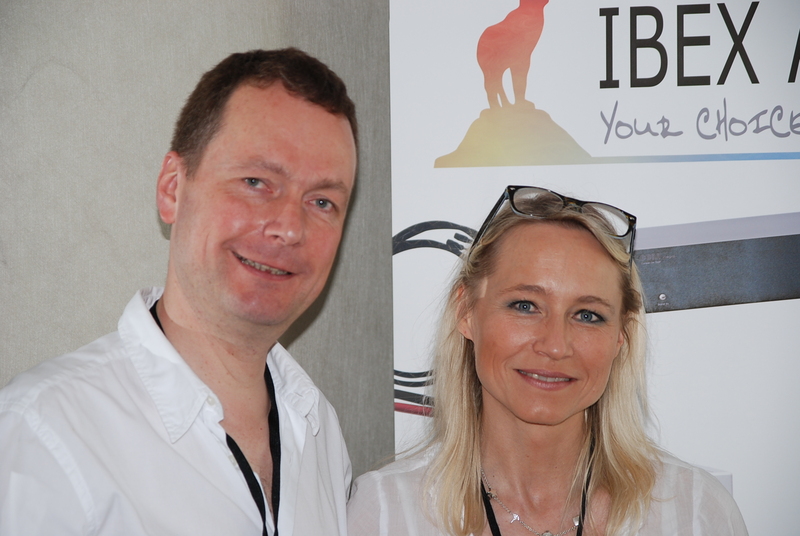 I have the pleasure to talk to Nicole Hannig, owner of IBEX AUDIO from Heidenheim. Click here to read the entire interview. "... und die musikalischen Meriten sind die besten Empfehlungen für den Mystère ia11 und wir freuen uns wie Bolle, dieses Prachtstück von einem Verstärker bis auf Weiteres als Analogreferenz in unserer Redaktion zu haben." Ibex und Durob Audio sagen 'Herzlichen Dank' für diesen fantastischen Bericht, der auf der IBEX Website zum Download bereit steht. "Rocket Man" ein. Ein Moment, der Duft meiner Jugend, immer abrufbar. Diesem Moment beizustehen, ihn Rom-wise wiedergeben zu können, ist dem Mystere ia11 möglich. Da macht's auch nichts mehr aus, dass der Wein im Glas aus dem Gigondas kommt, und nicht vom Vesuv. The Absolute Sound’s Editors’ Choice Awards has just released its annual Recommended Products list. They present the gear that their editors and writers have selected as most worthy of your consideration. These are the components they themselves would buy—or recommend to friends and family. "Built like a tank, the CA21 is a fine example of the minimalist approach: a line preamp with an input selector and a volume control, but no balance control. A giant killer in clarity, soundstage transparency, and detail resolution, its slightly closed-in treble highlights the midrange. Tonally, the center of gravity is the lower midrange, enabling a big-tone portrayal of cello and upright bass." Some news of Musical Truth. 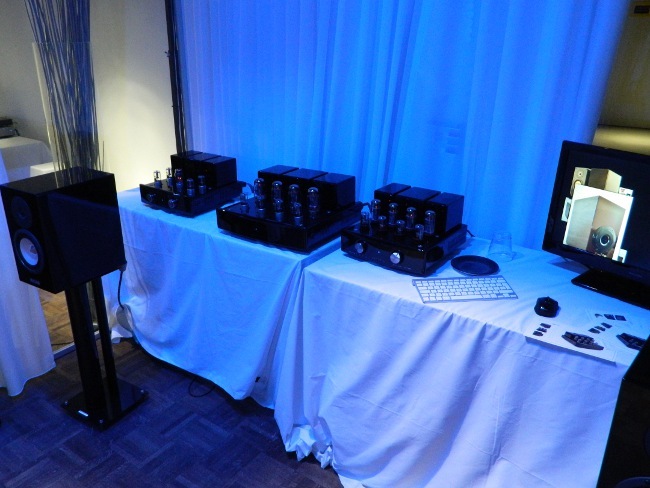 Last weekend's exhibit at High End Show Massan in Stockholm was a real success and Mystère was described as "the most pleasant sound of the show". A few words from Kristian Hayes: "We were very proud to demonstrate the Mystère ia11 and ca11 with pa21 together with american DC10 Audio and Ukrainian Contrast speakers. Our showroom did not empty all day long and I can say that 7 out of 10 visitors said that they either liked the sound best or that it was the most pleasant sound of the show. What stood out was the warmth and softness of the sound. Next door, there were systems many times the Mystère price, but still our visitors prefered the sound of the EL 34 and they said the sound was more natural." The Mystère ia11, and outstanding winner! Outstanding Winner. Mystère ia11, again a Mystère winner! 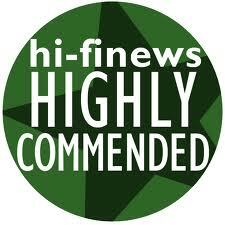 In a Hi-Fi News group test, our Mystère ia11 Integrated Amplifier was crowned “Outstanding Winner”. Hi-Fi News’ conclusion: “My pick of the bunch though is the Mystère ia11, which really surprised me with the smoothness and neutrality of its presentation as well as the quality of its finish and the care which has also been taken over styling. Its sound is ideally suited to long term listening, especially if you have a preference for the gentler musical genres. There is plenty of power available which means that you are not restricted to very sensitive loudspeakers, although matching may require some experimentation due to its high output impedance. Only the rather basic facilities let the ia11 down – a recording output (also useful for driving a headphone amplifier) and a remote volume control would make it easier to build a system around; but these are minor considerations when you hear how this amplifier sounds. In my book it’s outstanding. HIGHLY COMMENDED. 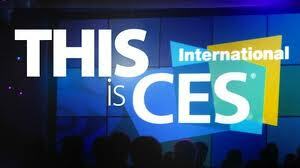 During Las Vegas CES 2013 our distributor Kevin Deal will introduce 2 new Mystère mono amplifiers, the ma11 and ma21. As you can guess, these are based on our pa11 and pa21 models. There is not a whole lot of news to tell about these models, except that they give double power compared to their stereo versions. The tube sockets are mounted a little lower than in the other models, to give space to the popular Tungsol KT120 tubes. Further specifications, information and pictures will follow as soon as possible. Mystère can be found during the Las Vegas CES 2013 in The Venetian, room 29-316.
,,... Mein äußeres Erscheinungsbild muss in den letzten Wochen mehr als gelitten haben. Denn an den nötigen Schlaf war selten zu denken. Jede einzelne Nacht mit dem Mystère ia21 wurde genutzt...,, Georg-Cölestin Jatta in Heft 01/2013 Click here to read the complete review. What a review!!! 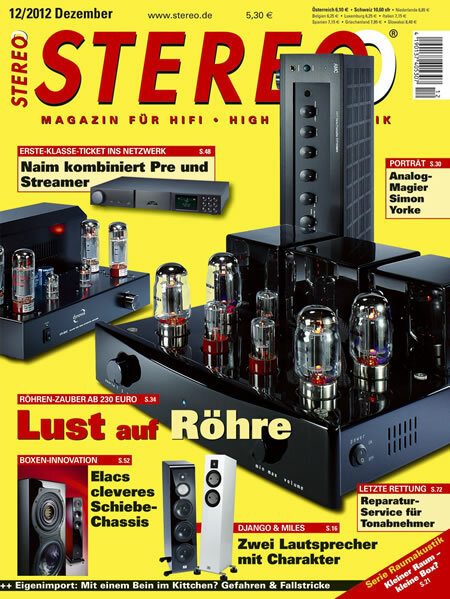 According to Christian Bayer, reviewer at Fidelity magazine in Germany, the ia11 Integrated Amplifier is a real Best-Buy. "Der Mystère ist aus meiner Sicht ein echter Best-Buy, er kann nicht nur rocken, sondern auch rollen." Want to know more, read here the full review. 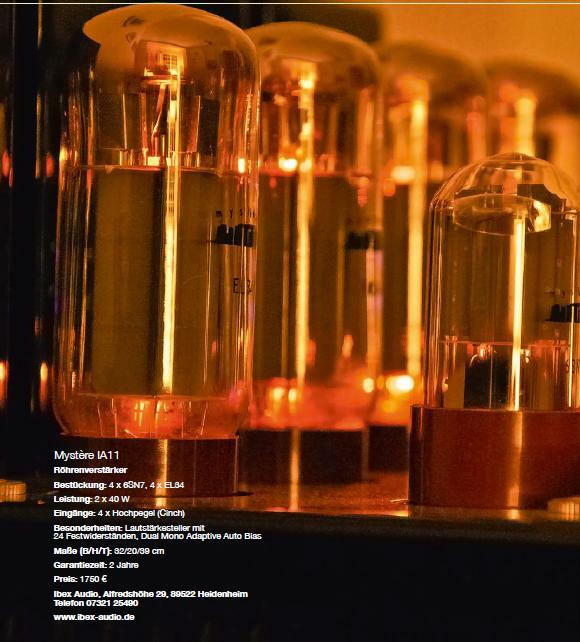 For a while we have been reluctant to approve use of Tungsol KT120 tubes in our Mystère amplifiers. 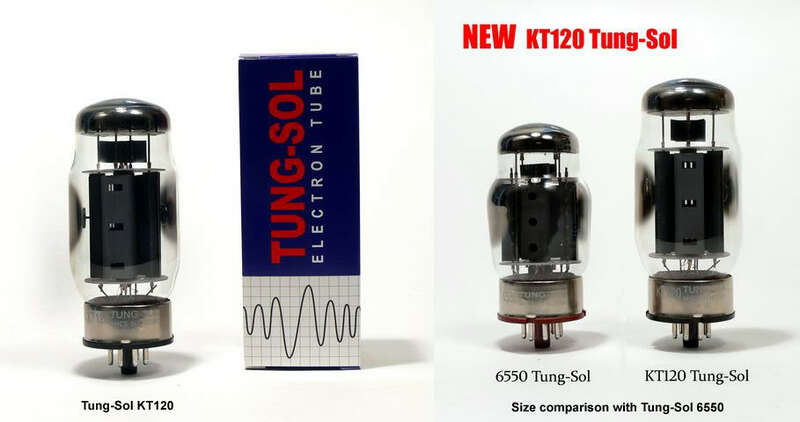 After we have been playing for months with all Mystère models equipped with KT120 tubes, we can say it’s official: you CAN use Tungsol KT120 tubes in your Mystère amps. Use the KT88 bias setting. One quick note: The KT120 is about 1/2" taller than a KT88. So you have to keep the tube cage off to use the KT120’s. And let us mention also here our updated use manuals. Check out the manuals as found on this new website, which are marked “Updated Fuse Information Inside” for all Mystère models. Ibex Audio has been working hard in Germany to get Mystère the reputation they feel the brand deserves in Germany. This is a country often driven by other than musical passions in choosing their audio preferences, so believe me it is not always easy to get the attention for the pure musical intentions of an audio product. But … Nicole and Michael Hannig did it. Their first Mystère review by Michael Lang resulted in an “Excellent” conclusion. Hope more German reviews like this one will follow for Mystère. "... Der Durchgang im Labor war zur Lockerungsübung geraten ..."
"... Großartig, wie präzise der Mystère diese feinen Abstufungen im Charakter der vorgeschalteten Komponenten darstellte und zugleich mit einer ungemeinen Leidenschaft zu Werke ging ..."
"... Höchst erfreulich, wenn sich Erfahrung, Sorgfalt und eine kundenfreundliche Kalkulation so verbinden ..."
Our new German distributor Ibex Audio displays at the High End show in Munich. 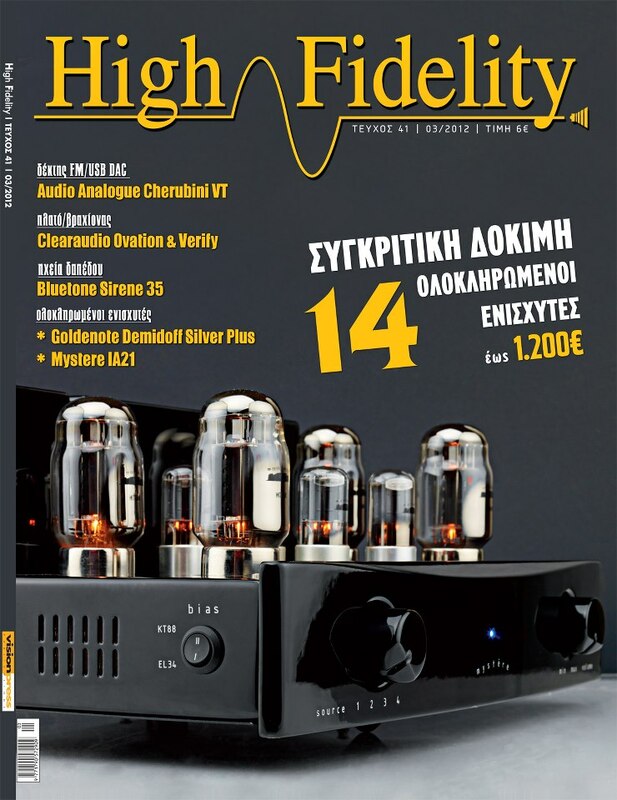 High-Fidelity magazine (Greece) reviews the ia21 and dedicates its front cover to Mystère. Eventually I made it across the hall to the Mystère room. The star attractions here were the pa21 and ca21. The ca21 ($2195) is a full-sizechassis line preamp featuring tube rectification, DC filament supplies, zero global feedback, a high-quality 24-step volume attenuator, an SRRP gain stage, and a modified White cathode-follower output stage for low output impedance. The pa21 ($2995) is the ca21’s matching amplifier, nominally a 55Wpc KT88-based power amp, although it may be easily switched to EL34 use. The adaptive autobias board allows one to run either tube at its optimal bias level. The front end was the wellknown PrimaLuna Eight CD player and cabling was by DH Labs. What I was absolutely not ready for was the magical coupling between the Mystère gear and the MartinLogan Summit X hybrid ESLs. Every once in a while you run into a match made in heaven— and this was definitely one of them. Fantastic midrange clarity and soundstage transparency to die for. Bass quality and integration were surprisingly good even under show conditions. 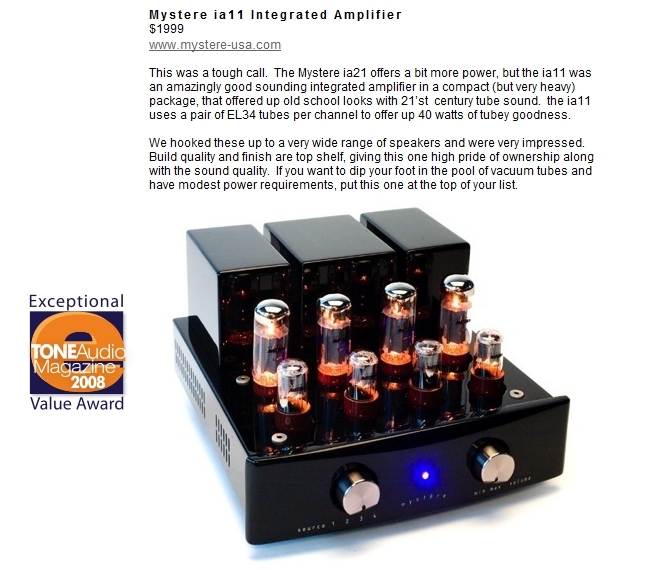 Mystere wins Exceptional Value Award from Tone Audio! Tone Audio reviewed both the ia11 and ia21. 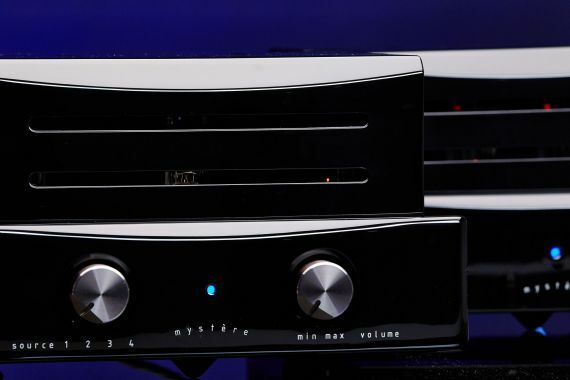 They loved both amps, but the smaller ia11 wins the accolades for its price. Tone Audio is a free online webzine with great reviewers and exceptional content... plus the publisher takes incredible photos of all the gear his webzine reviews. 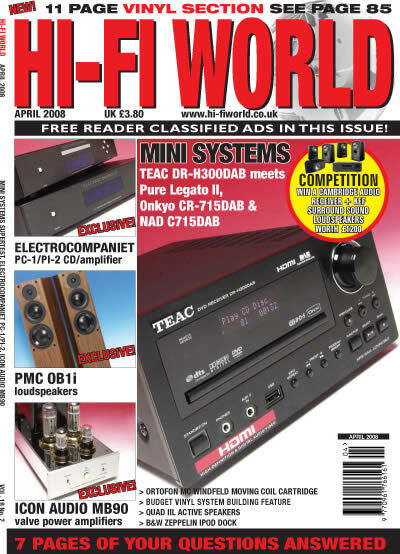 In their March 2008 issue, HI-FI World reviews our Mystère IA11 integrated amplifier. Check out their review to read how they get to the conclusion that our IA11 "with lovely midband and treble, this slick, well built amp is an easy listen". We just finished the design of 4 new Mystère models! 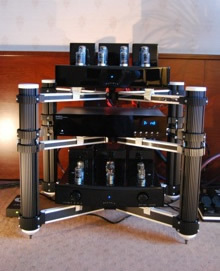 Two preamplifiers and two poweramplifiers. One combination in the 11 range -CA11 and PA11- and one combination in the 21 range CA21 and PA21-. I guess it's time to start thinking of matching sources? CES 2008 is over and we would like to thank all visitors for passing by our room. Response to our products was great and the luxury of our Mystère products was praised many times. I also want to thank Mr. Kevin Deal (picture) and his team. New in the team is Mr. Dave Hudspeth, Prima Voce's National Sales Manager, of Golden Tube and Sumiko fame, for which he was working before. US dealers can reach Dave by email at dave@primavoceaudio.com or by phone on +1 909/921-8662. Have a look here to see some pictures of our room in The Venetian. Mystère will be exhibiting during Las Vegas 2008 CES in the room of it's distributor Upscale Audio / Prima Voce: The Venetian Hotel, room 29-139. Next to the Mystère brand, Mr. Kevin Deal will show the full PrimaLuna line and the first samples of HeDo, a new line of affordable solidstate audio equipment. 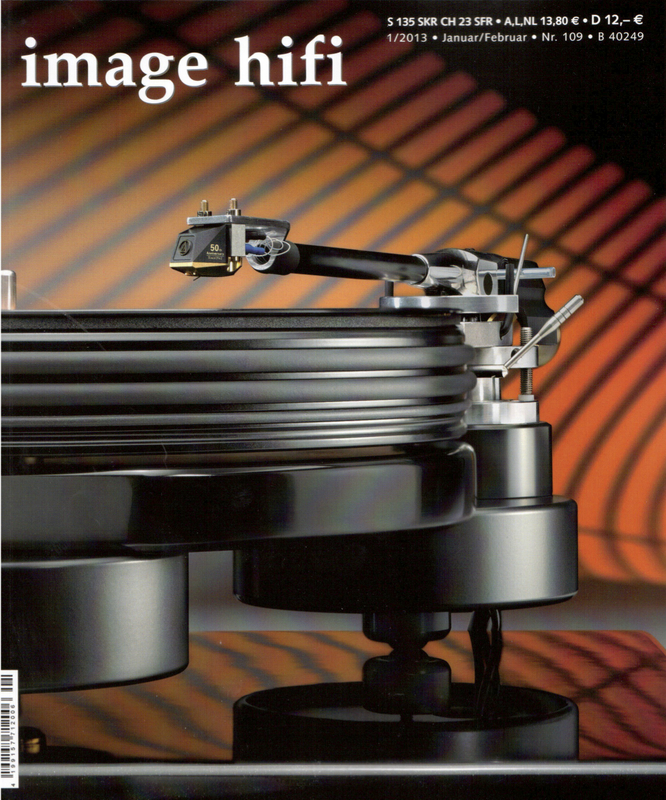 Mystère's IA21 has been reviewed in one of UK main hifi magazines, Hifi Choice. If you like to read what others think of us, get yourself a copy of their latest issue. Later on we will provide you with a link to this review. We are proud to say that our IA21 amplifier received Hifi Choice's BEST BUY recommendation!